Chief columnist (foreign policy) at le Figaro. 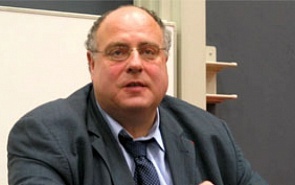 Previous positions: Professor of History, Йcole Normale Supйrieure (Paris), War College (Paris); Teaching position : University Paris VIII, War Defense College (Paris), Journalist and columnist: Liberation, Le Monde, French public Radio France Culture. Research interests: foreign affairs, military policy and strategy, world economics. Selected publications: Four books on geopolitics (American Policy, Turkey and Iran, the Middle East). Participant of Annual Meeting: 2009. Muammar Gaddafi will not surrender into the hands of people inimical to him, especially to the West. Russia has a card that can be played. Moscow has been in close contact with Tripoli for the past 30 years and Mikhail Margelov, who is a Middle East scholar, is a fitting person to send a message and to negotiate something.